Holiday shopping on the Internet has come of age. In fact, 2011 was its debutante year. Last year, consumers embraced e-commerce with enthusiasm, and retailers reaped the rewards. 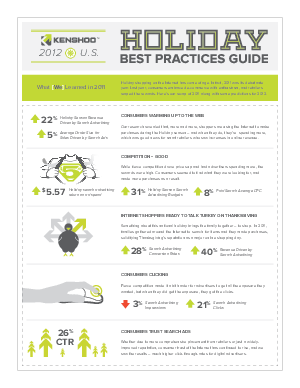 In this 2011 best practices tip sheet for the US, we explore the numbers for the holiday season including advertising, search engine advertising, impressions, clicks and much more. Here's our recap of 2011 along with some predictions for 2012.